The photo shows the Department of Design Research (as it was later know) at the Royal College of Art some time prior to 1965. 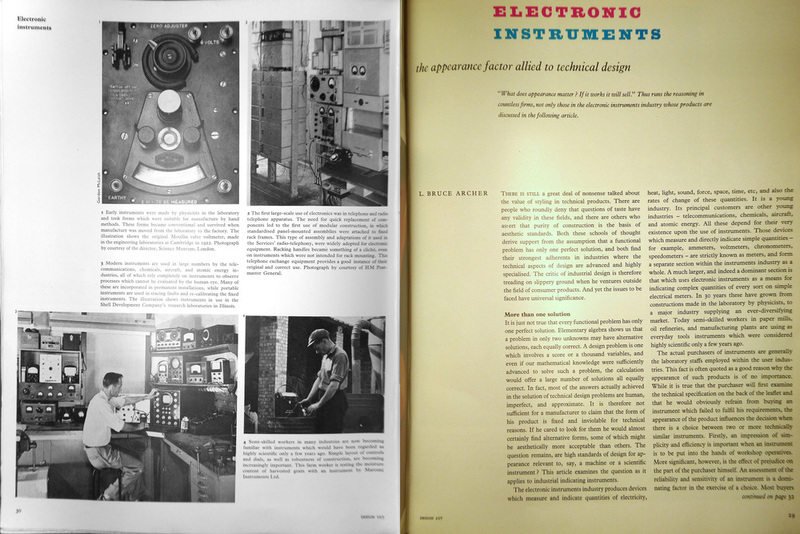 At that time it was known as the School of Industrial Design (Engineering) Research Unit. This photo appeared quite widely, including in the SIA Journal of October-November 1965 which featured ‘Designing a Hospital Bed: Research and Analysis’ and in Ken Baynes’ 1967 book Industrial Design & the Community (London: Lund Humphries). Photo by WJ Toomey (copyright holder unknown). This online exhibition introduces a project to document and evaluate the early history of Design Research in the UK, focusing on the Department of Design Research and its predecessors at the Royal College of Art, London. The exhibits illustrate a number of themes, many of them concerned with the varied roles of the leader of the Department, Professor L Bruce Archer. They are organised around a series of images, highlighting important themes, and not necessarily presented in chronological order. The exhibition has been put together by Stephen Boyd Davis, Professor of Design Research at the RCA, and Dr. Simone Gristwood of Middlesex and Lancaster universities. They are grateful to Neil Parkinson, archivist at the RCA and many other individuals too numerous to name. Currently in its early stages, the project is seeking funding to develop a deeper research inquiry. Many individuals have been approached to share their insights and evidence and have kindly agreed. If you are knowledgeable about the early days of Design Research, especially at the RCA, or want to offer a perspective on the subject, please get in touch with Stephen. This photograph, showing the staff of the research unit who worked on the development of the Royal College of Art hospital bedstead, is a graphic demonstration of the fact that many major pieces of design depend on teamwork. It is worth recording just who the people involved are and what they do. On the extreme left is Gillian Patterson, information research assistant, a graduate research librarian. Next to her, at the back, is Reg Talbot, an ergonomist and systems analyst who was responsible for planning the validation studies. Third from the left, right in front, is Kenneth Agnew, industrial designer, research fellow at the Royal College of Art, and Mr Archer’s principal assistant. Fourth from the left, right at the back, is Tony Driver, College staff sheet metal craftsman. Next from the left, in the middle row, is Doreen Norton, a nursing sister with a fine research record behind her, and nursing adviser to the Unit. Right at the back is Pauline Benington, secretary and office manager to the research Unit. Next to her is Ken Ireland, College staff machine shop craftsman. Right in the very middle is Irfon Roberts, secretary of the Working Party to whom the Unit reports and also a deputy director of the Hospital Centre, who are the project’s sponsors. Behind him is Ed Walden, mechanical draughtsman. In front, with arms folded, is Bruce Archer, director of the Unit. Fourth from the right, Peter Slann, aeronautical engineer responsible for structural analysis and advice. Third from the right is Gordon Cork, welder on the staff of the Unit. Second on the right is Eleanor Piclet, Mr Archer’s private secretary, and on the extreme right is Charles Denroche, a builder of experimental metal work, who developed and made some of the mechanisms. Not shown, of course, are the very large number of doctors, nurses and research workers in other establishments who gave information and advice. 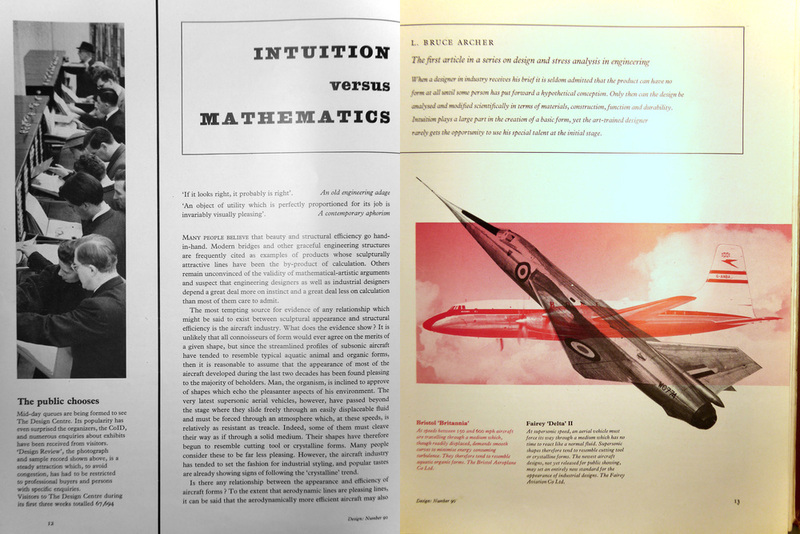 Details of the cover and inside pages of the RCA Calendar for 1961-62. 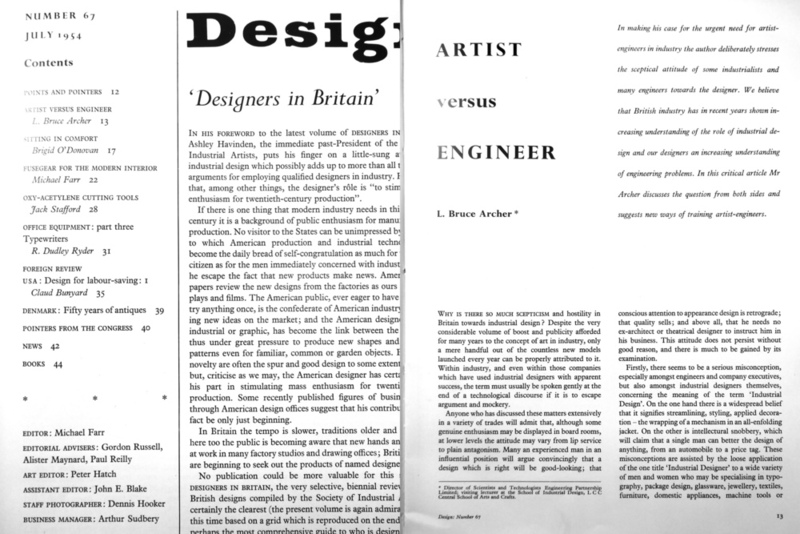 The Department of Design Research traced its origins to 1961 when Professor Misha Black invited Bruce Archer to the RCA as a Research Fellow. The Department of Design Research traced its origins back to 1961 when Professor Misha Black, head of the School of Industrial Design (Engineering), invited Bruce Archer to the RCA to lead a research project that Black had created under the title Studies in the function and design of non-surgical hospital equipment, to be funded by the Nuffield Foundation. 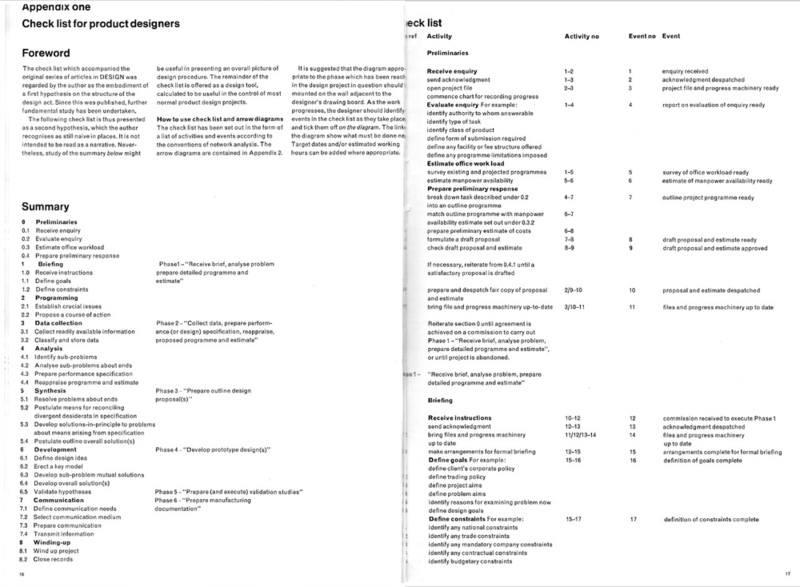 Some examples to emphasise the practical design projects of the Department. Design activities included fact-finding and needs-analysis, drawing and low-fidelity prototyping, building prototypes in a range of materials in the RCA workshops, manufacturers constructing advanced prototypes, and extensive user-testing within the DDR and externally on site. 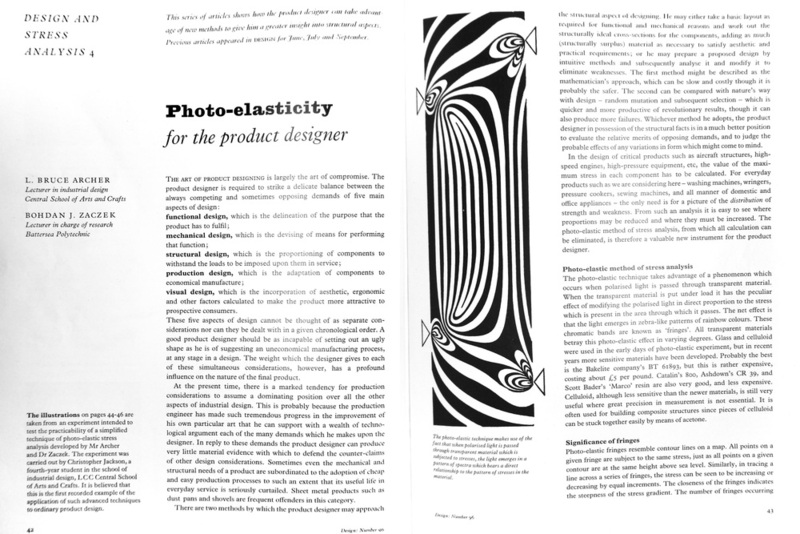 Sometimes seen as a theoretically-oriented enterprise, the Department of Design Research always engaged in practical design projects as well as theoretical development. Practical research activities brought in much of the essential funding of the Department. 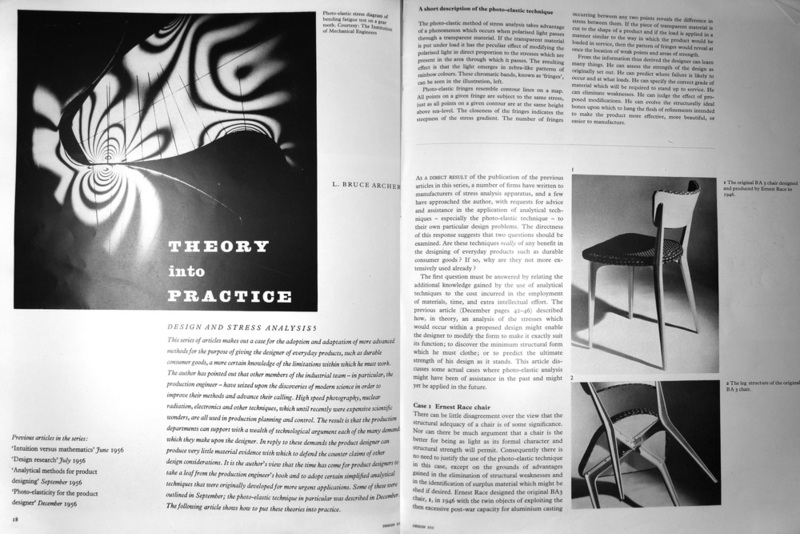 More importantly, they acted as a test bed for ideas: theory fed into practice and vice versa. In our paper for DRS 2016 (Boyd Davis and Gristwood 2016), we argue that Bruce Archer's theoretical model of designing was fundamentally altered by his experience of large multi-disciplinary projects such as the King's Fund hospital bed. 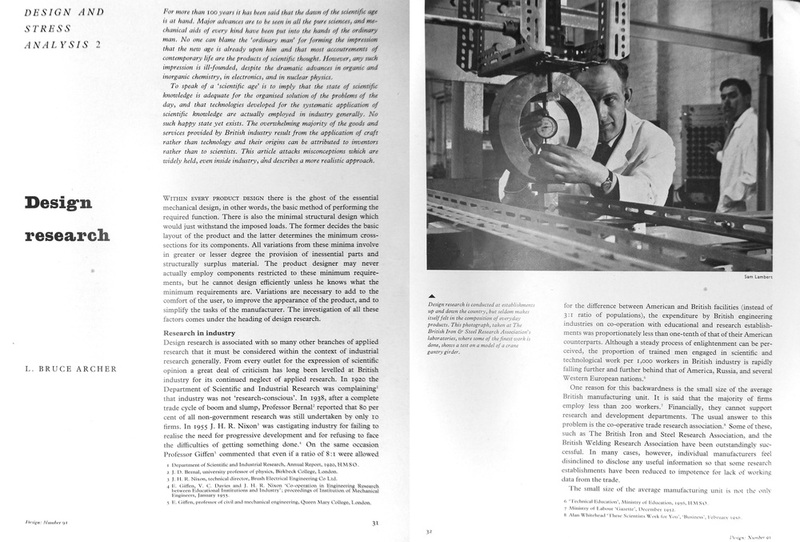 A key figure in the practical design work was Kenneth Agnew, who graduated in Engineering Design at the RCA having originally trained as an architect. A Research Fellow from 1965, he become a central figure in the DDR through to 1978, designing the Hospital Bed and working on many other projects. He was later Professor of Design at the University of Ulster. Kenneth has been one of our key sources of information for this project. Many of the pictures are taken from his Archive recently acquired by the RCA. Bruce Archer (centre) at the International Council of Societies of Industrial Design in Vienna in 1965. 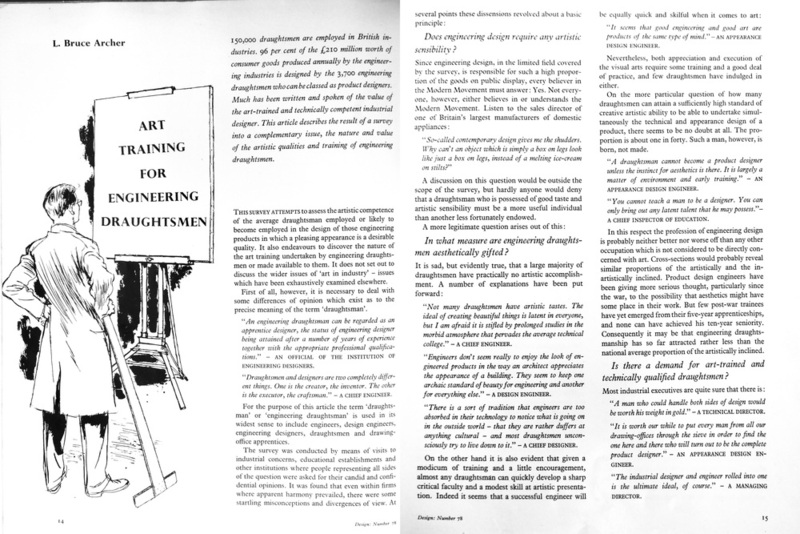 From the Agnew Archive at the Royal College of Art, London. We produced our own design, as well, for three good reasons. First of all, it is an excellent discipline on research if one knows that one must produce a design in conformity with it in the end. Secondly, it is an excellent discipline upon the existing manufacturers, who would be less inclined to say that the specification could not be met if they knew we were going to meet it ourselves. Thirdly, it was necessary to have at least one bed design exactly meeting the specification in order to carry out field tests in hospitals to prove whether our specification was any good or not. There was a fourth reason. There would be no justification for such research to be carried out in a design school if no design was going to result. (Archer address at The International Council of Societies of Industrial Design (ICSID), Vienna, 1965, quoted in Baynes 1967:48). The Department of Design Research Job Number Book is part of the DDR archive at the Victoria and Albert Museum. Currently at the museum's store at Blythe House in Blythe Road, West Kensington, London, its future location is uncertain as the store is due to close. The V&A, Science Museum Group and British Museum all store artefacts at Blythe House. An important document going back to the early days of the DDR is the Job Number Book. It lists jobs sequentially whether they were undertaken by the department as such or privately by individuals within the department. The opening page notes that only the R/U (presumably Research Unit) director can allocate numbers, or in his absence 'GAP' (Gillian Patterson, a graduate research librarian). Patterson 'was mathematically adept and took on special responsibility for information handling. Subsequently she ran entire projects when they inclined more to this field than to actual design and engineering, and became a Research Fellow in the Unit' (Lawrence 2001). Patterson worked for the Department throughout its existence. She was also the partner of Patrick Purcell. 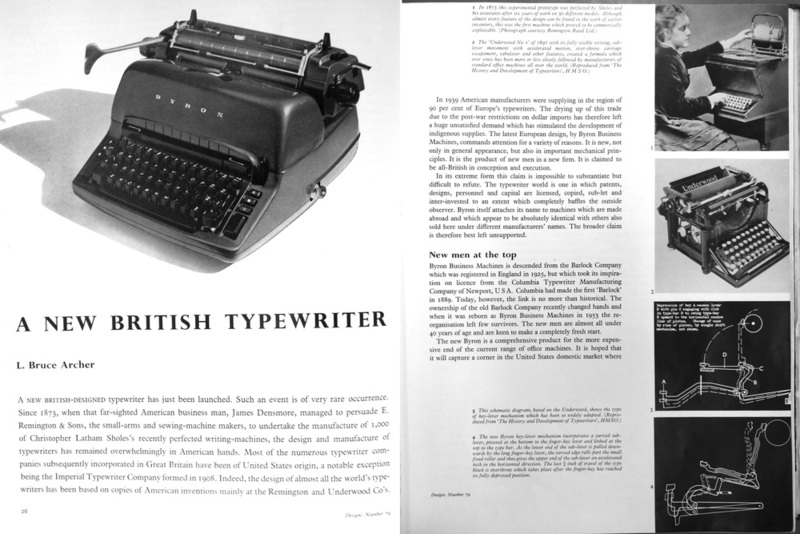 Patrick was a key figure at the RCA, at Imperial and at the MIT Media Lab, and a pioneer of computing in design. The research project on Archer and the DDR will use the Job Number Book as an important source to establish the chronology of the projects and external relationships of the Department. It requires extensive correlation with other evidence published and unpublished. Lawrence, Ghislaine. 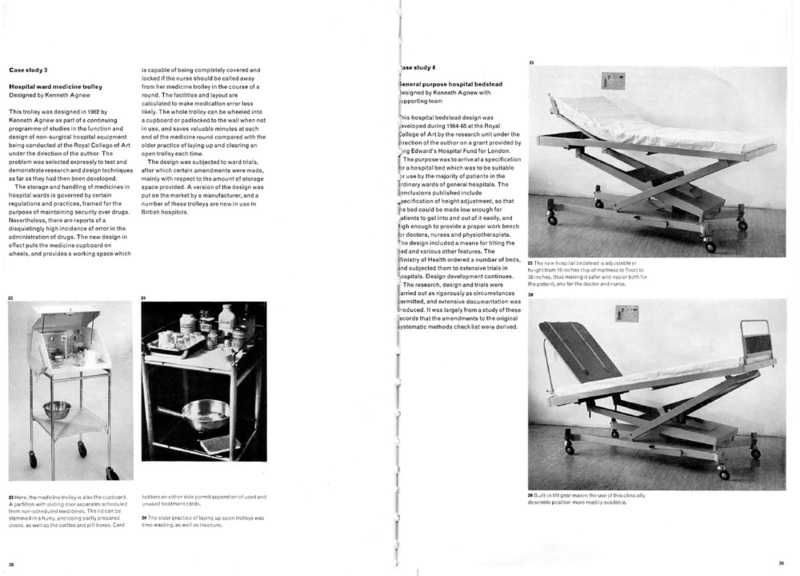 (2001) Hospital beds by design: a socio-historical account of the 'King’s Fund Bed', 1960-1975. PhD thesis of the University of London. Available on the British Library Ethos service, ID: uk.bl.ethos.271734. Available online at Archive.org. It is not known whether any recordings still exist of Archer's six-part schools TV series for Granada, or of the notorious Panorama 'televisual research'. The L Bruce Archive at the RCA contains a few photographs of a television set during the Granada broadcasts. The DDR Archive at the V&A has the script for the Panorama programme, and some acrimonious correspondence with Paul Fox of the BBC about the truncation of the planned broadcast and a copy of a letter to the Times on the subject. In both archives are material used for planning and presenting the Panorama programme, including at the V&A a large number of glass-mounted slides for the explanatory graphics. The DDR made pioneering use of television, not only to communicate its messages about design, but also as a research tool. In 1964, Bruce Archer wrote and presented a set of six half-hour programmes for the commercial UK television company Granada's schools programmes, broadcast from 27 April to 15 June. The topics were How the Designer Thinks, The Human Factor, Aesthetics and Fashion, The Means and the Ends, Caveat emptor, and Computers in design. Preparation for the programme by the RCA team was meticulous. Cardboard cut-outs of the bed parts to be demonstrated were made, painted grey overall, but with the parts to which attention was being drawn during any particular question picked out in brighter colours. The format of the broadcast was to consist of the questionnaire being read out by Archer, while the relevant part or operation of the bed was demonstrated with the cardboard models. The script was timed to the last second. The RCA team's hopes were high on the evening of 3rd February 1964 as, throughout the country, nursing, medical and administrative staff gathered around hospital television sets. At the last moment, however, disaster struck in the form of the Soviet Foreign Minister, visiting Britain to celebrate the 40th anniversary of British recognition of the Soviet Union. Panorama secured an interview with the Minister which took half of the time allocated to the bed feature. What is important at this stage is to ensure that the failure of the experiment, due to last minute cuts by BBC staff, should not be used as an excuse for avoiding anything on similar lines in the future. It may be difficult to win back the co-operation of angered doctors and nurses, but the scope for research by television is enormous and is clearly a most valuable method of collecting information on a hitherto impossible scale. Despite this setback, the RCA did produce a report from the data they had managed to gather: Report No.10, Results of a Television Enquiry on Certain Features of the Hospital Bedstead (Royal College of Art, June 1964). It is not certain what copies remain of this document, which is probably in the partly catalogued archive at the V&A. Cousins, James (1965) 'Research: A general purpose bedstead for hospitals.' Design 195 (March 1965). 52-57. It can be viewed online on the website of the Visual Arts and Data Service.